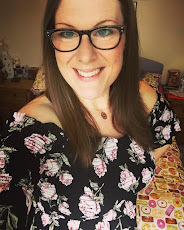 As a special Friday night treat (and to cheer me up as my back is so sore & its driving me nuts being stuck indoors)...My Mr took me out to The Cheese Kitchen on Castle Road in Bedford last night. They have recently opened a second premises next door but one, which is now the deli/cheese room and so have been able to turn what was their deli into a 'bistro' with around five tables, which I'm pleased to say is now open on Friday and Saturday nights from 7:00pm, offering a full 3-course menu. 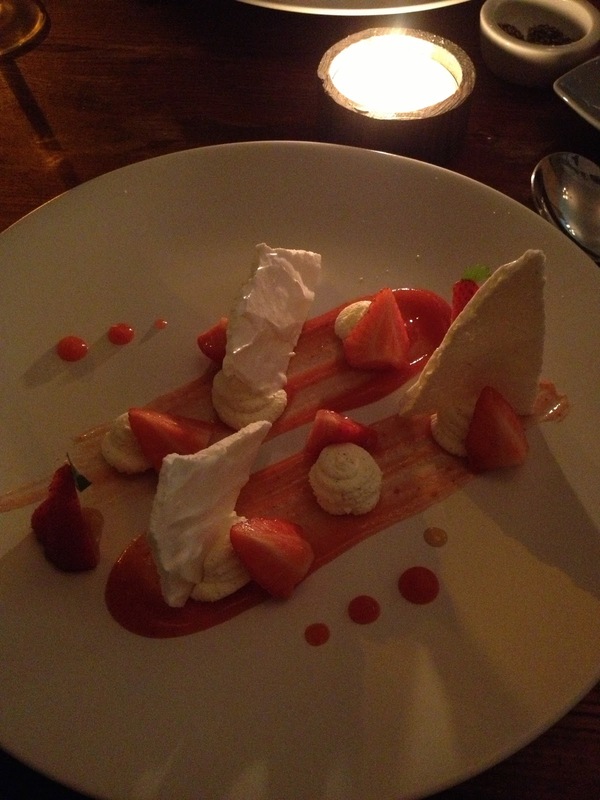 We were lucky enough to be their first Friday-night diners, and what a treat it was!! We were welcomed by the lovely Helen and Justin, and looked after incredibly well by our lovely waitress who was just the right amount of smiley, polite and attentive. It wasn't long before we were introduced to the very dashing chef Joris, he is a Parisian whose passion for his food and great quality produce is infectious! He asked if we had any allergies or any foods we really disliked, to ensure we had the best experience possible. We felt special and utterly spoilt from the moment we walked in. The small and intimate atmosphere is very romantic, the soft candlelight, delicious smells from the kitchen & the 2 bottles of Prosecco we drunk definitely added to the ambience! We were instantly bought a basket of delicious brown and white bread with a decadently salty butter, which was fantastic as we were very hungry. Next, we chose and were served our wine, which was reasonably priced at £14.95 per bottle, although a house white or red was even more reasonable at around £10 per bottle. 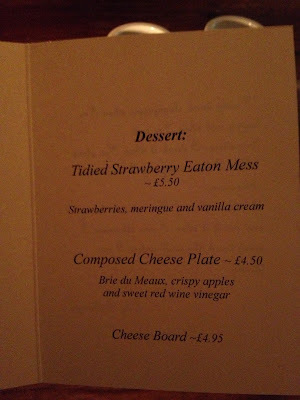 Then, most exciting part of the evening - we were given our menus. 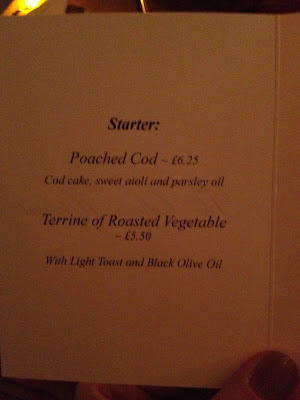 There are two choices for the starter and main courses (one meat/fish based, one vegetarian) and it was so exciting to know there was little choice, which to me means that the dishes on offer would be very well thought out and cooked to the highest standard - we were not disappointed. A few minutes after our order was taken we were presented with an amuse-bouche from chef Joris (The term is French, literally translated to "mouth amuser", and is designed to wake up the taste buds before your first course arrives). 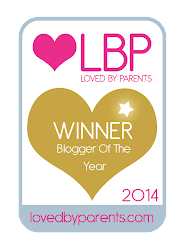 What a lovely surprise! What a joy to receive an unexpected course! It was an absolutely exquisite pumpkin and roast chestnut soup, served with a swirl of bacon-infused cream (what can be better than anything infused with bacon??) 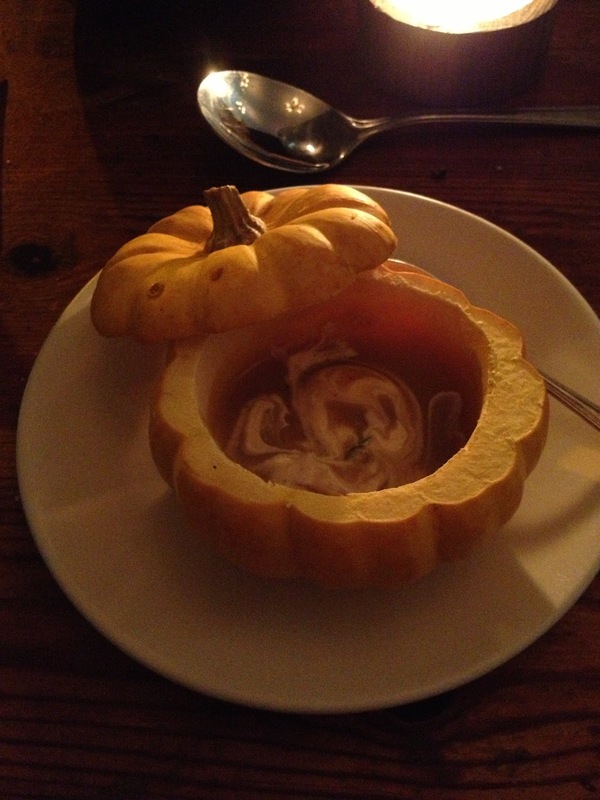 all presented in a munchkin pumpkin shell. So beautiful, so full of deep flavour and subtle sweetness - a PERFECT start to the meal. 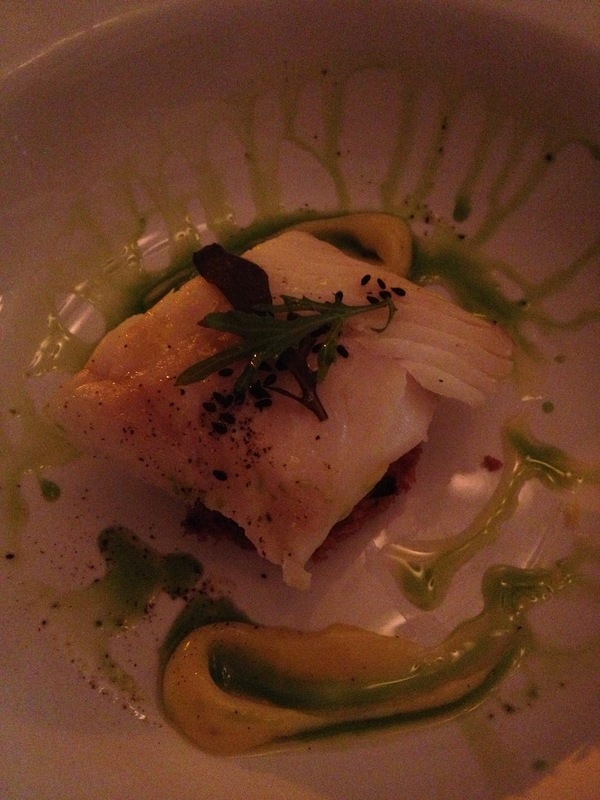 Next came our cod starters (my husbands favourite course of the night!) ... a lusciously meaty, yet delicate and perfectly moist, flaky piece of cod, served on a crispy fried cod cake, which cut through the freshness of the fish perfectly, making the dish feel wholesome, filling, and giving it that edge of decadence only fried-food can! The aioli and parsley oil and hint of lemon in the sauces complimented the fish and added unbelievable flavour to this dish. We were seriously bereft upon taking our last mouthfuls - the sort of food you never want to end. 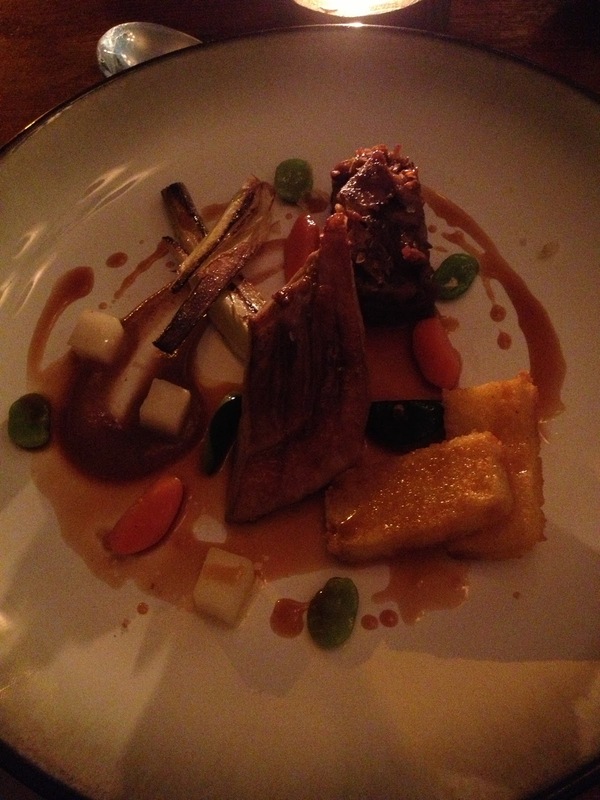 How could chef Joris top this...had he peeked too soon we wondered? 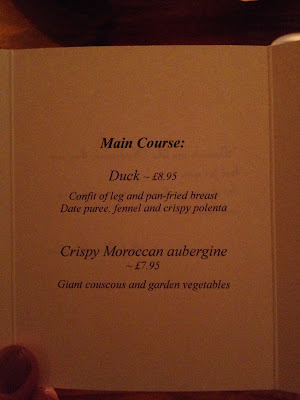 No need to worry, as the duck (my favourite course) had just as much to offer its eaters as the first course. The duck breast was pink and juicy, plump and full of the sweetness and spicy tones you expect from a decent breast of duck. The confit (my personal highlight) was just exquisite; so tender, so full of flavour that you can only get from duck fat! The meat was accompanied by crispy polenta (a new favourite of mine, I've now had polenta on 3-4 occasions and most definitely am going to start experimenting with it in my own kitchen) which was soft and tender in the centre with a perfect crust; to me it has much more to offer in terms of flavour than potato - and who can resist that bright sunshine colour on your plate? A first for me last night was trying the fennel, which was expertly poached and then pan fried (to dull the strong aniseed flavour down so that it perfectly complimented every part of the dish, according to Chef Joris) and how right he was - it was put simply; just scrummy! The fig puree bought the whole dish together and just made it sing! Slightly less sweet & pungent than the usual plum sauce you would expect with duck; the fig was an earthier flavour with just the right amount of sweet and saltiness to make this dish rise above other duck dishes I've tried. Finally (and purely because we were at The Cheese Kitchen you understand!) 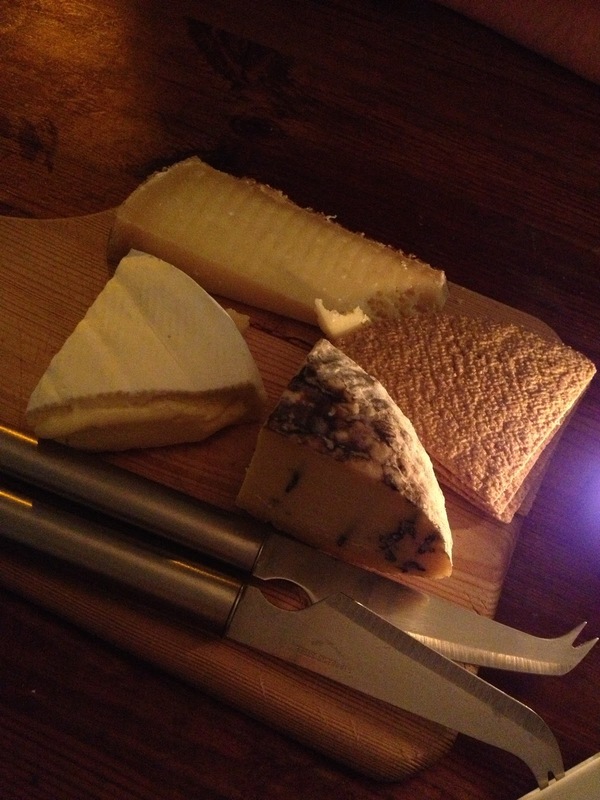 we indulged in a cheese board to share. 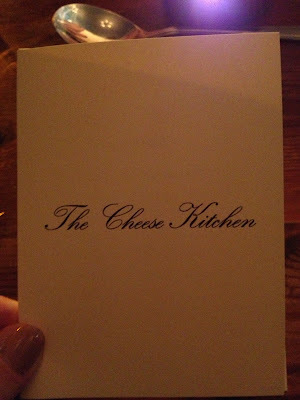 How could we not eat cheese at The Cheese Kitchen, it would be sacrilege not to! We were served a beautifully soft and creamy Somerset Brie, a rich Oxfordshire Blue, and a with oaty crackers; a perfect end to a truly splendid meal. 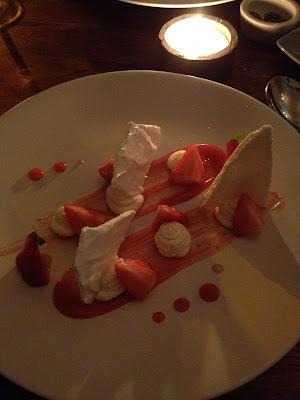 I have to say for the quality of the food, the complexity of flavour, the warm and efficient service, all in a sweet and intimate environment, and just a stones throw away (almost!) from our front door, we were elated to discover this little gem of a place; and will most definitely be returning & waxing lyrical to all who will listen about our experience. The whole meal came in at we think a very reasonable £76 (this included two bottles of Prosecco at £14.95 a bottle)....faultless. I have to say that each course was small-ish in size but perfectly formed, and I would recommend going whole heartedly into a full three courses (or more!) if your budget allows. We came away pleasantly full - but had we had just one or two courses we may well have come away feeling a little peckish. Go for it, treat yourselves...you know you deserve it! 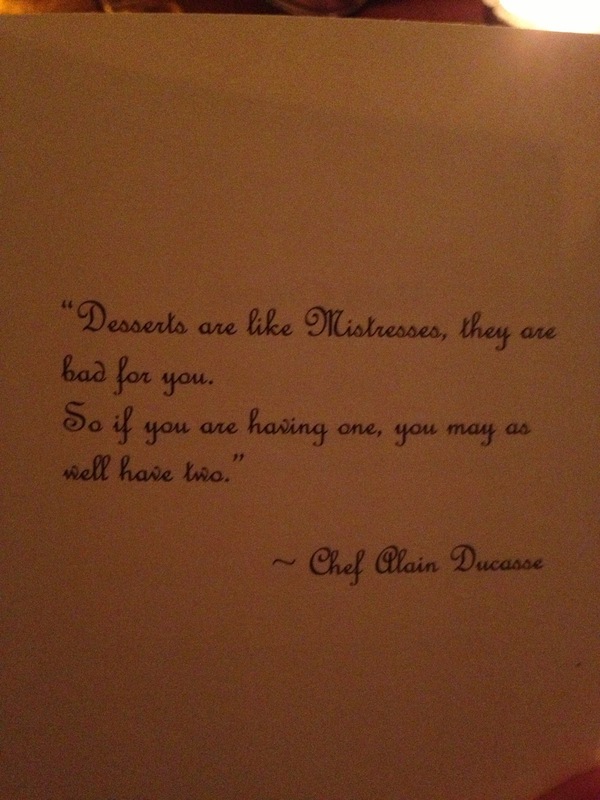 wise words from Alain Ducasse on The Cheese Kitchen menu! 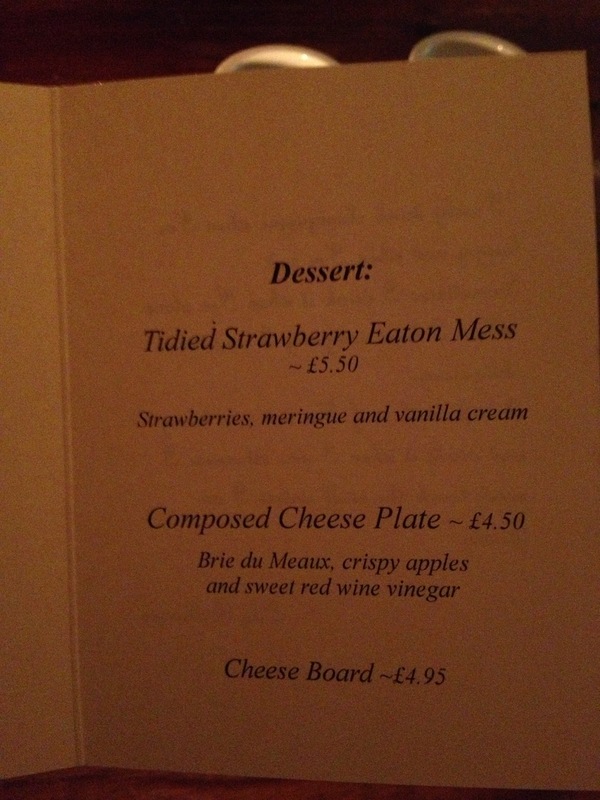 We have also recently discovered this little gem of a Bistro and agree with everything you say. Incredibly good value for such outstanding food, and a great atmosphere too. The Cheese Kitchen Bistro rocks! Thanks for your comment guys! Yes - the bistro is insanely good - so glad you agree! Thanks for reading.